We are currently under the process of rebranding our Club logo to incorporate the new Club name: El Camino and Chevelle Classics. Our presence on the web will also be changing to reflect this change over the next year. Those of you following the Club on our Facebook page may have already noticed the name change there. The Club name change has been made due to the strong interest of Chevelle owners wanting to join the Club. The El Camino Classics Club is a group of El Camino and Chevelle enthusiasts. We are located in the North Seattle area of Washington State. While many of our members own El Caminos and Chevelles, we are an open club and we welcome all local car enthusiasts interested in Cruising, Car Shows, Drag Racing, and Bench Racing. As the years proceed, the Club is looking forward to adding more new members, and adding more activities, with monthly cruises and local members hosting the upcoming monthly meeting at their residences. This is so we can just have some fun while socializing as a Club. Check here for Registration Form. 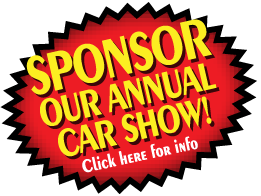 We would be proud to have more sponsors for our Club's Annual Show find out more here. Check out the site often! We are committed to giving the best experience on the site for members and non-members. We hope that the new website look will help you with your enthusiasm as it does ours. Please, take a look around at the new features available. If you are an El Camino Classic enthusiast, and want to join, please check here for more info. © 2013 El Camino Classics • All rights reserved any and all content of site may not be reproduced without permission. Please send website questions and or comments to the WEBMASTER HERE. elcaminoclassics.com site is best viewed using the latest versions of common browsers.